"What took weeks, now takes hours..."
In her first piece for WhichPLM in 2018, resident digital printing expert Debbie McKeegan shares the success of digitally printed fashion. Debbie is the CEO of TexIntel – an expert advisory practice serving the Creative, Digital and Print Textile manufacturing Industry. The Fashion industry is no stranger to disruption, and it’s facing a global reform. Driven by consumer trends, it’s now struggling to cope with the Fast Fashion business model it created. In order to remain profitable, the market must now produce multiple, season-less collections on demand and that’s no easy task for large and small companies across the globe. Without digital printing technology this wouldn’t be possible. Digital print is one of the key drivers within the sector and it’s pushing the market place forward at an accelerated rate, as the availability of digitally printed fabric print providers, or companies printing inhouse booms so will diversity within the fashion market. Fashion Fabric Digital Print has broken the one billion sq metre barrier this year, and is forecast to double over the next three years. Speed to market is the expectation of today’s tech savvy consumer, with high expectations of service, they don’t easily tolerate anything that keeps them waiting. The implications of this change in both the consumers expectation of the Fashion Industry, and the purchasing responsibility for the fashion buyer, are profound, as product held in stock for too long becomes like food that is past its sell by date: worthless. The advent of Digital Textile Printing was a boon to those who recognised these trends and applied the benefits early. Gone was the complexity of Fashion Fabric Production, manufacturing in the present requires an automated workflow. What took weeks now takes hours. Digital print machines, have evolved over the last decade to meet demand and now offer the marketplace multiple speeds. Built for speed, and Fast Fashion, digital print machinery is now available that offers an incredible print capacity of 4,000m per hour. Digital print technology now equals the print speed offered by the Rotary screen process and with new efficient manufacturing, volume print prices offered per square metre have also tumbled, with many print providers now offering Digital print at the same price as Rotary for large meterages. This has been a game changer in the Fashion industry built for “Print on Demand”. Trends, be they design or sales in origin, are now serviced in days, and as the fickle fashion marketplace flexes its workflow to accommodate speculative design and style, the Digital print marketplace expands with massive growth predicted to fulfil requirements in the next 5 years. Driving this revolution has been the requirement for a lightning fast supply chain, that delivers what the customer wants, on time, at the right price, and with impeccable quality. But it’s not all about speed – slow fashion demands the same versatility offered by the digital process, with smaller meterages, and a requirement for “print on demand”, no stock, and a local supply chain. With this machine manufacturers have been quick to spot a new and almost infinate emerging marketplace. For the SME’s machines printing at speeds from 30-200sqm per hour offer an affordable option for fabric printing. The birth of the Micro Brand, SME’s that require small to medium scale print production on demand. As demand has grown so has the clients awareness of process and we see a boom in Digital Print Providers, offering the designer low volume, high quality print with minimum lead times. In the fashion-world production workflow which now includes 3D Modelling, Computerised Cutting and Robotic Sewing Machines, Digital Textile Printing is an integral component. Using Rotary as a print process, it can take anywhere from one to three months for traditional screen-printer to produce a Fashion fabric. These lead times don’t equate to the needs of the marketplace. Digital Fashion Printing by comparison can happen immediately, with product available in a few hours, and it is this speed to market, above all else, that is the main reason for the current logarithmic growth in the Fashion Fabric market. Digital Textile Printing is therefore the keystone in the components that are driving the Fashion Industry to adopt the huge changes that are underway in Textile manufacture. The growth in this sector has been truly astronomical, but that is not the whole story, for it is also in the roots of this Industry where Digital Fabric Printing has caused a real revolution. 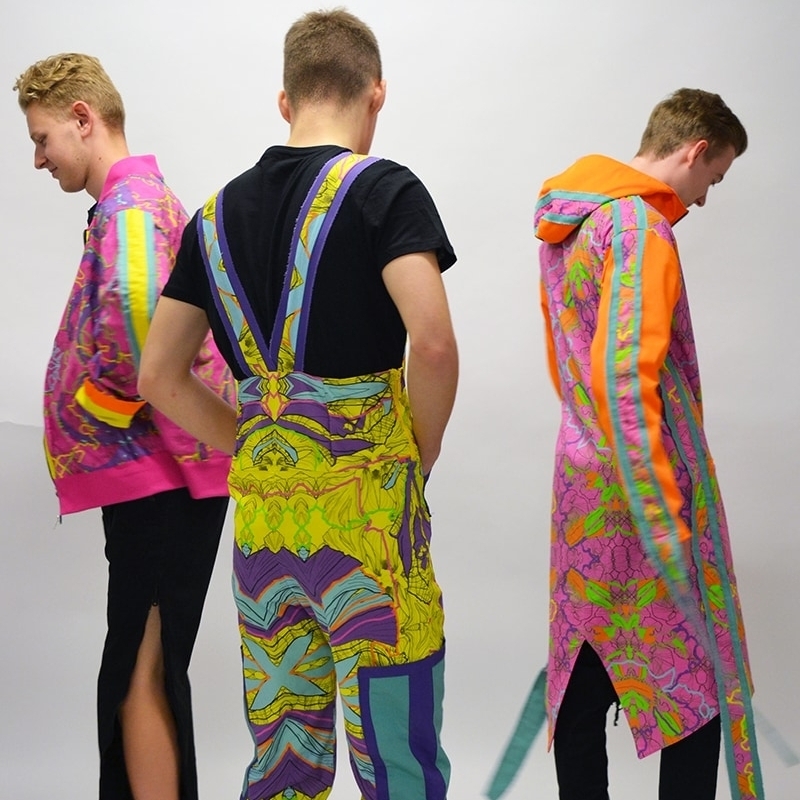 From the aspiring student at the Fashion College Diploma Show to the young designer starting a small niche brand, Digital fabric printing has proved to be a game-changer. Machinery prices alongside meterage have been tumbling, and nearly all the major Digital Print Manufacturers now offer entry level machines at prices little above the price of a fitted kitchen from B&Q. This has added tremendous impetus to the Fashion Fabric Market and there has been a huge growth in small Designer/Maker businesses with many predictions stating that this growth will continue unabated over the next three years. For these Designer/Maker brands with their own production machinery, new Fashion Concepts can be quickly produced and selected or discarded as required. Small runs can be manufactured without any commitment to large stocks and selling lines can be supported as they grow. Online sales are booming and with courier services providing an efficient delivery channel, the emphasis on speed to market has been growing. As an example, recently, Amazon have installed Digital Textile Printing machinery as an experiment to see just how fast they can service demand for Fashion products. Yet, without doubt, emerging small fashion brands, with their lightness of foot, up to date fashion sense and minimal overheads are ideally placed to take advantage of this scenario. Generally, the technology behind this is becoming less and less awe inspiring, and with the advent of reasonably priced pattern making software allowing for full product previews, the expensive tools of the trade, so often the preserve of the ‘big boys’, have now become openly available to a wider audience, and don’t they just love it! For the Designer/Maker sector, the growth of online retailing and the Direct to Consumer Model, means that most of these products will be sold through user created online shops, with low overheads and minimal stocks, thereby limiting the risk to the budding entrepreneur. There has been an explosion of these brands, as designers become aware of the opportunities afforded to them the Digital Print process. In this new world, an up and coming designer can produce beautiful products on a small scale, which successfully compete with the large players, whether it be on colour, design, style price or quality. Without the burden of heavy stock commitments, or commercial giant overheads, and offered for sale through readily available ecommerce media, these new Designer/Makers are making their mark, using Digital Textile Printing as one of the engines of their viability. The Fashion Industry has a long history of successful new brands, such as Mary Katrantzou, emerging from the Design Schools, where up and coming trends are recognised and established by newcomers to the industry without the shackles of conformity or expectation damping down the design process. Many would say that this is the lifeblood of the fashion industry, providing a vital seed bed of new talent, challenging established trends with new and inventive approaches to the age old challenges of design, colour and price. Reinforced by Digital Printing this particular Fashion sector, is taking advantage of the many opportunities afforded by new technologies and is expected to grow substantially and form an important part of the new Demand for Digital Fashion Textile printing as it pushes toward the 2 billion square metre barrier. DEBBIE MCKEEGAN Award winning British designer, Debbie McKeegan, began her digital journey almost two decades ago – pre-Photoshop, and pre-digital print. With a manufacturing background, a vast knowledge of traditional textiles (from both a design and production perspective), and an interest in CAD from its onset, today Debbie serves as an expert in the world of digital print.With her partner, she founded the Digetex Group in 2004 – specialising in Textiles and Wallpapers for a multitude of industries worldwide. Debbie has developed many new digital production practices, and speaks as an authority on digital design and print worldwide. As a WhichPLM contributor, she is able to pass on her wisdom as a digital pioneer; embracing the creative freedom offered with the advancement of new technology, she looks forward to sharing her knowledge.